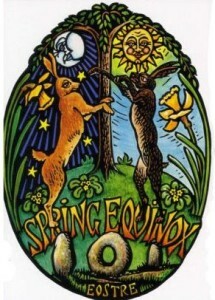 Blessed Ostara! 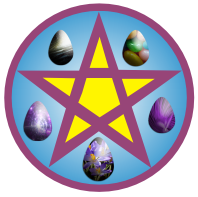 Open Circle for Ostara on Friday 3/23 at 7pm. Featured photo by Ken Gagne. The sky is a big blue bowl with wispy white decorations on the southern rim. The sunlight is amazingly bright and it’s 56F. 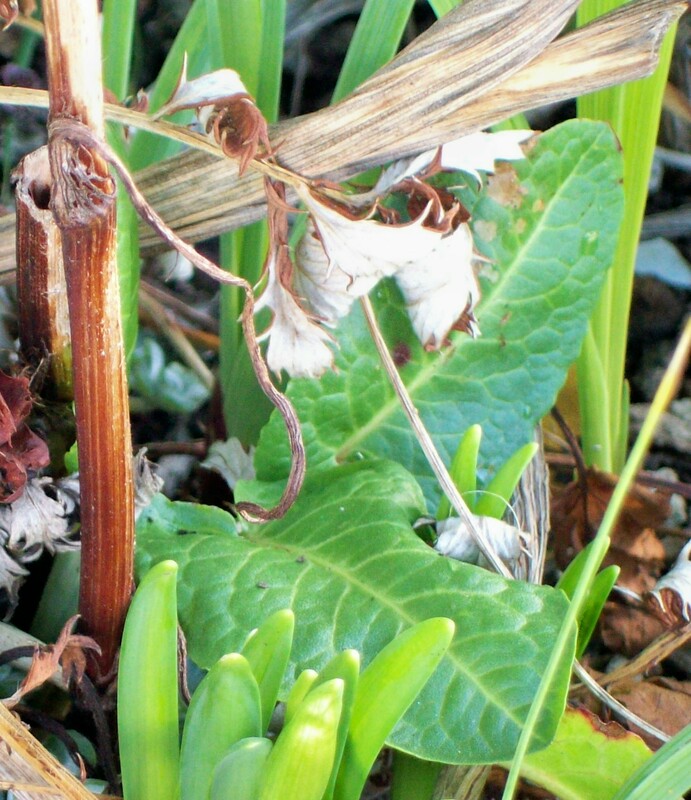 It actually is starting to feel like spring! The wind is at 3mph and nowhere close is it over 10mph. The chance of rain starts getting higher this evening and tomorrow we’re supposed to be about 2/3 of an inch, so enjoy the weather while we have it! We had a good class/esbat and ended up by going outside to see the beautiful Diana’s Bow hanging high in the western sky. We stopped early because of people needing time after to do other things. I spent awhile while Tempus was working on some things. He made some yummy grilled ham and cheese sandwiches as a supper. I had my lentils earlier. I worked on the Feast page and Tempus did some more dishes and we didn’t head home until past 1am. Today, by contrast, I have no energy. I dragged up the path and staggered into the shop and flopped into my chair. I’m hoping for coffee soon. Yes, we’re at the shop today. There’s still so much to be done before summer hits! I have some tiny yarrow plants to get into pots. There’s more to be done in the back, more books to deal with, more shelves to clean off and clean out. …and then the paper run tonight. It ought to be a nice night for a drive, though. 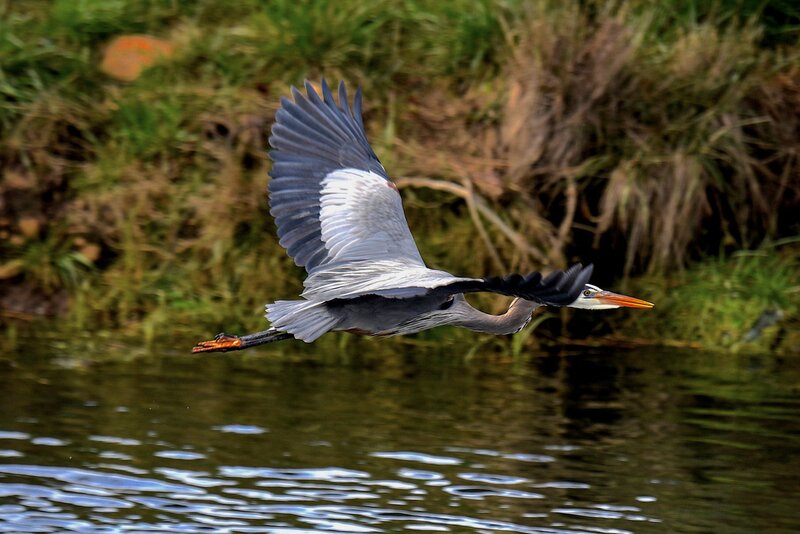 A Great Blue Heron from yesterday morning. Photo by Ken Gagne. Waxing Moon Magick – The waxing moon is for constructive magick, such as love, wealth, success, courage, friendship, luck or healthy, protection, divination. Any working that needs extra power, such as help finding a new job or healings for serious conditions, can be done now. Also, love, knowledge, legal undertakings, money and dreams. Phase ends at the Tide Change on 3/31 at 5:37am. 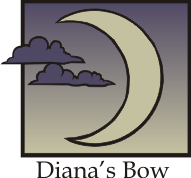 Diana’s Bow – On the 3rd day after the new moon you can (weather permitting) see the tiny crescent in the sky, the New Moon holding the Old Moon in her arms. Begin on your goals for the next month. A good time for job interviews or starting a project. Take a concrete step! God/dess aspect: Daughter/Son/Innocence – Associated God/dess: Vesta, Horus. Phase ends on 3/20 at 6:12pm. Waxing Crescent phase – Keywords for the Crescent phase are: expansion, growth, struggle, opportunity. It is the time in a cycle that you gather the wisdom learned in the new phase and communicate your intention to move forward. Light a candle. Write or read an affirmation. LISTEN & ABSORB. Commit to your goal. God/dess aspect: Maiden/Youth, energy and enthusiasm – Associated God/dess: Artemis & Apollo, Mayet/Djehuti, Freya/Frey. Phase ends at the Quarter on 3.24 at 8:35am. 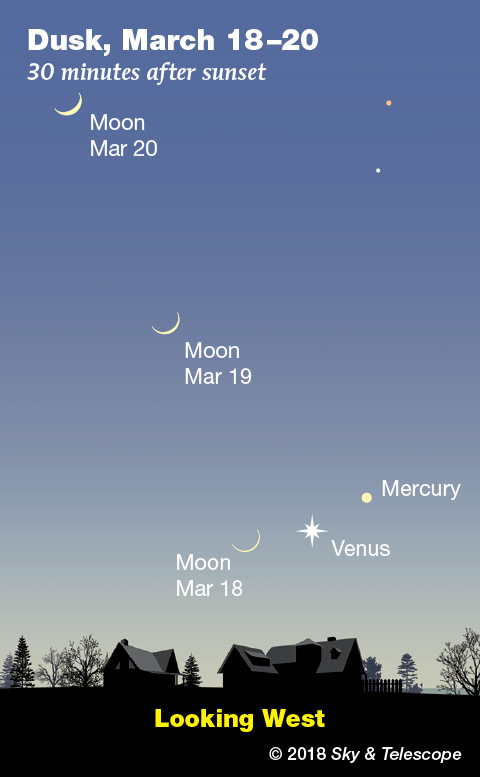 On Sunday evening the 18th, catch the short viewing window for the Moon-Venus-Mercury lineup after twilight dims and before they set. 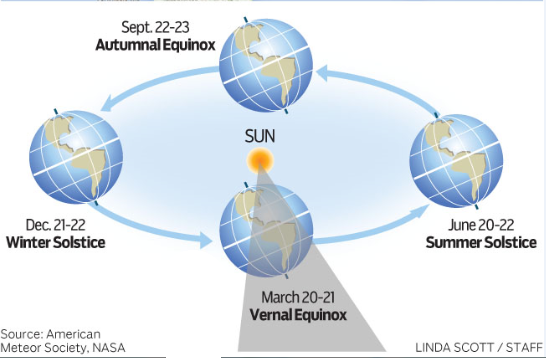 Today is the equinox. 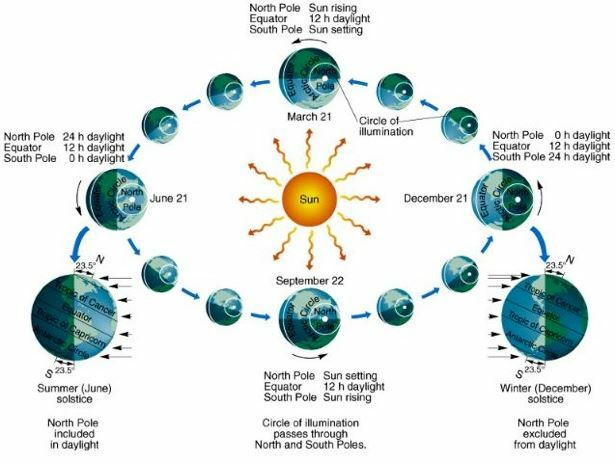 At 12:15 p.m. EDT the center of the Sun crosses the equator — both Earth’s equator and the celestial equator, which Earth’s equator defines. 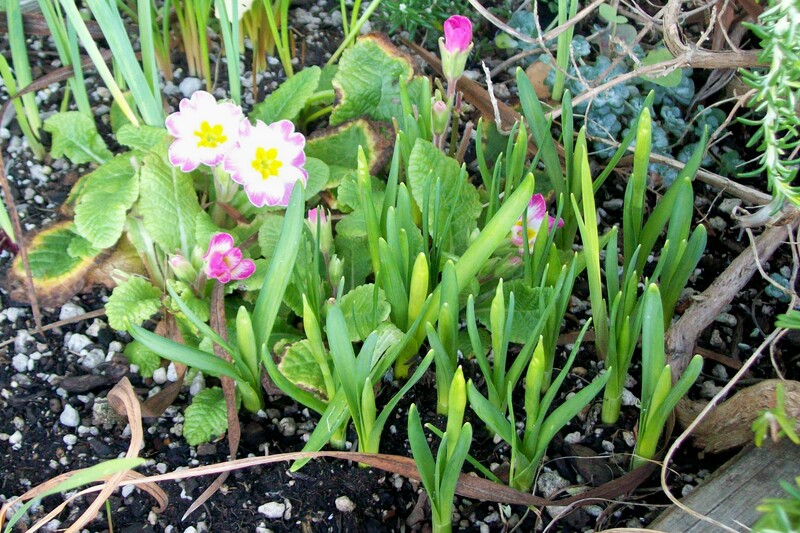 This moment marks the beginning of spring in the Northern Hemisphere, fall in the Southern Hemisphere. And no, eggs don’t balance better today than at any other time! After dark Leo strides up the eastern sky, with his brightest star Regulus in his forefoot and the Sickle of Leo extending upper left from there. 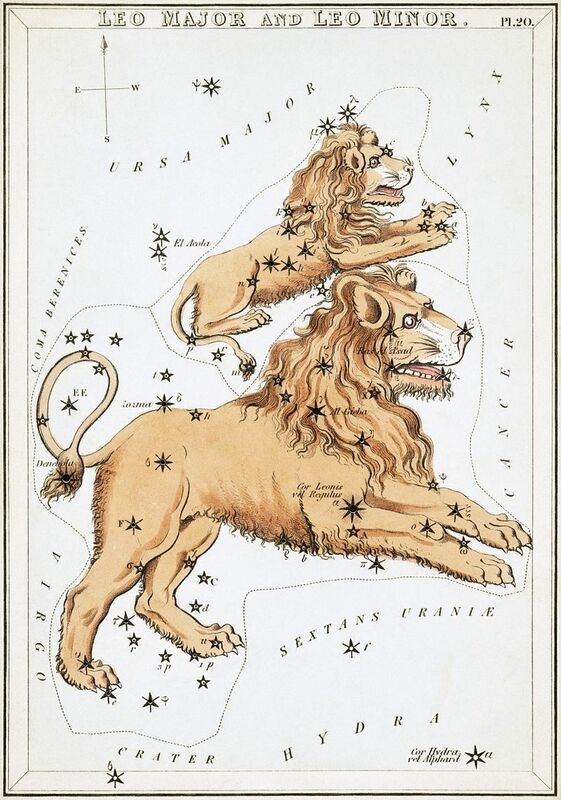 About two fists lower left of Regulus are the two stars of Leo’s rear end and tail: Delta Leonis (magnitude 2.5) and, below it, slightly brighter Beta Leonis, or Denebola, the tail tip (magnitude 2.1). As evening grows late and this scene rises higher, look left of Denebola, by a fist or a little bit more, for the big, dim Coma Berenices star cluster. Its brightest members form an upside-down, tilted Y. It’s visible even through some light pollution. If you can’t see it naked-eye, binoculars reveal it well, looking rather ragged and more or less filling the field of view. Mars and Saturn, together in Sagittarius, rise around 3 a.m. daylight-saving time. At the beginning of dawn they’re the brightest points moderately low in the south-southeast, above the fainter Sagittarius Teapot. They’re equally bright at magnitude +0.5, but Mars is redder. Far to their right at that time is Antares, and farther right is bright Jupiter. Mars continues drawing closer to Saturn as seen from Earth’s moving point of view. 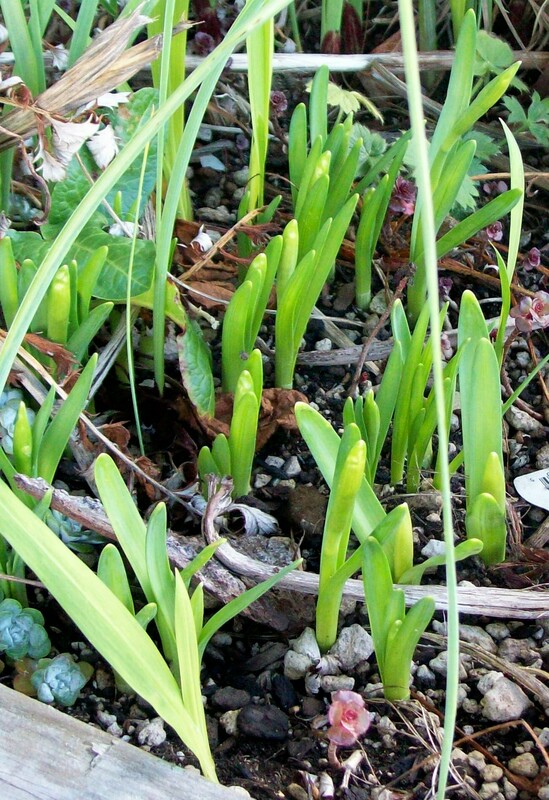 They appear 8½° apart on the morning of March 17th and 5° apart by the 24th. They’ll pass each other by 1.3° on April 2nd. Celtic Tree Month of Fearn/Alder, Mar 18 – Apr 14. Runic half-month of Berkana/ Beorc, 3/14-29 Half-month ruled by the goddess of the birch tree; a time of purification for rebirth and new beginnings. Sun in Pisces enters Aries at 9:15am. Celtic Tree Month of Fearn/Alder, Mar 18 – Apr 14. Fern (FAIR-n) Alder – The common alder (Alnus glutinosa (L.) Gaertner) is common along lowland rivers, where it grows with aspens, poplars, and willows. Like willows, alders sprout from stumps. This allows them to regenerate after heavy flooding. 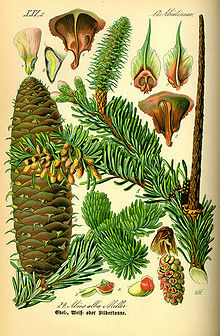 In protect sites they may grow to 20 m (65 feet) tall. Their leaves are more blunt-tipped than most North American alders, which look more like the grey alder (A. incana (L.) Moench). 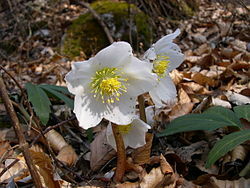 This species is more common in the mountains of Europe, and is not restricted to moist soils. 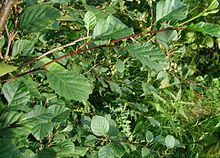 Like ashes, European alders are not widely cultivated in North American (they are often sold as black alders), but several native species are. Alder wood is said to resist rotting when it is wet, and was the wood of choice for pilings in many regions. Alders are members of the Birch family (Betulaceae). Affirmation/Thought for the Day – Change your attitude and your whole life will change. Coconut Carrot Cake – http://autumnearthsong.com/2012/03/03/ostara-recipes-2012/ I adore carrot cake….and this is a spicy moist one..delish!! Mix the flours, salt, sugar and baking powder together. Add about 1/2 cup water and mix well, adding a bit more water if needed to make a stiff dough. Turn out on a lightly floured surface and knead until dough becomes elastic and smooth. Let rest for 10 minutes. Roll out 1/2 inch thick. Cut into squares, strips or circles. Deep fry in very hot oil until golden brown. Drain on brown paper bags or paper towels. Drizzle honey in a very thin stream over bread and serve immediately. Sprinkle with a little cinnamon if desired. 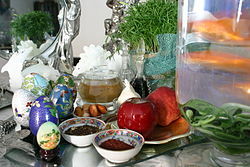 This entry was posted in Daily Stuff and tagged Affirmation, Astrology, Astronomy, Celtic Tree Month, Goddess Month, Iris Tenax, Journal Prompt, Magick, March borrowit from April, Moon, moon phase, Nowruz, Oregon Coast, Oregon Iris, Ostara, Ostara recipes, Pagan, Quick Quotes, Runic Half Month, Silliness, Tides, Today’s Feast, Today’s Plant, Weather, Wicca. Bookmark the permalink.